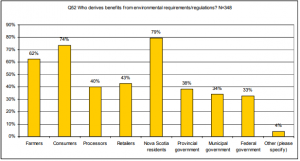 During the period from February 8 to April 17, 2006, Kelco Consulting conducted a survey of the membership for the Nova Scotia Federation of Agriculture (NSFA). The purpose of the study was to identify perspectives on a variety of issues affecting the farming community in this province. The approach taken in the survey process consisted of the development and circulation of a survey that was designed to collect data on a number of issues related to farm practices in food safety, food security, food quality, and environmental goods and services. The survey was developed in close consultation with the NSFA and developed so that it could be circulated in hardcopy format as well as electronically through a web-link from the Federation’s homepage. Several stakeholders offered comments on an earlier draft version of the survey which resulted in a fairly length survey which took respondents an estimated 20 minutes to complete. The length of the survey was the most significant challenge to the process. Strategies to bolster awareness of the survey process included a direct mailing to NSFA membership as well as several references to the survey process through the NSFA’s newsletter and their website. By the end of the survey process, we had collected 377 completed surveys had been collected, with an error rate of +/- 4.64%, 19 times out of 20 (95% confidence). 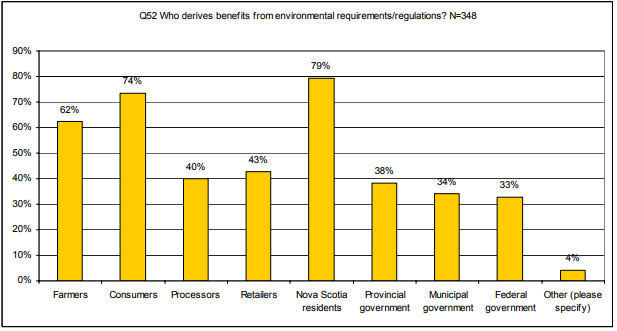 The 377 response were generated through a combination of mail-in hardcopy responses (84%) and on-line responses (16%).